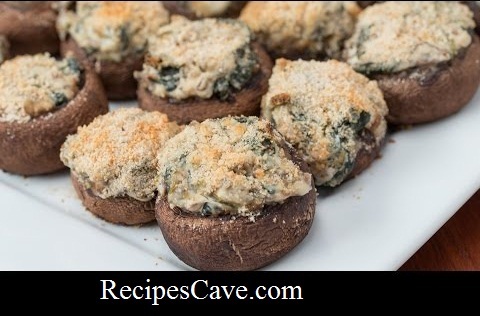 Creamy Spinach-Stuffed Mushroom - How to cook Creamy Spinach-Stuffed Mushroom follow these simple steps. 2. Remove the stems from the mushrooms. Place the top half on a baking sheet and mince the stems. 3. Melt the butter in a pan and add the minced stems and minced garlic. Stir and cook for 2 minutes. 5. Take a spoonful of the spinach mixture and fill each mushroom top. 6. Mix bread crumbs and parmesan cheese in a bowl and sprinkle the mixture on top of the dip stuffed mushrooms. Your Creamy Spinach-Stuffed Mushroom recipe is ready.